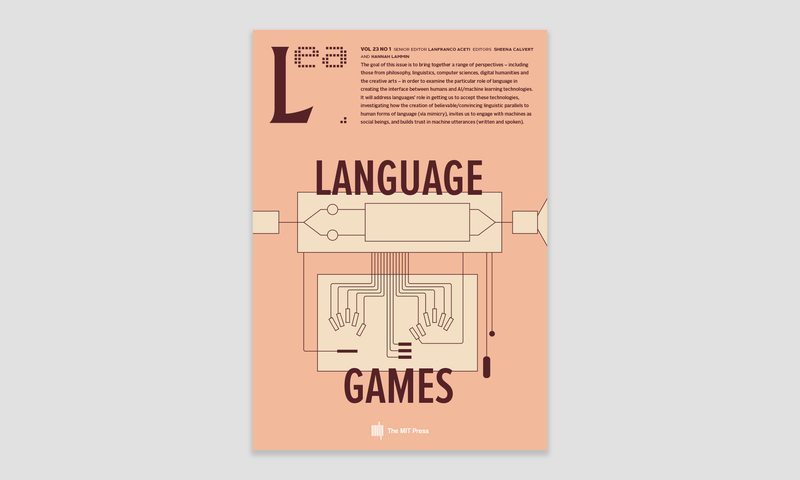 Language Games is the title of a forthcoming issue with LEA edited by Lanfranco Aceti, Sheena Calvert, and Hannah Lammin. We invite a range of submissions initially in the form of abstract. The description of the issue is below with all the related information for submission. Language is a technology, as theorists including Martin Heidegger and Marshall McLuhan have argued, and yet its manifestation in both speech and writing is fundamentally human-centred: anthropological. However, speech and writing are rapidly becoming an interface not just between humans and the ‘out there’, as traditional philosophies of language assert, but between humans and machines, and machines and other machines. As a result, the usual presuppositions we might make about language as a technology which is predicated on human utterance and man-made material transcription is rapidly shifting, and in the process the line between human and machine is becoming less clear. Current developments in computing, and the rise of artificial intelligence (AI), are bringing about a new perceptual transformation of the technology called language, and offer us an opportunity to reflect on what we value in language and how it continues to form (and inform) our life-world. The mass availability of intelligent personal assistants—such as Apple’s Siri, IBM’s Watson and Amazon’s Alexa, and Google’s Duplex—has brought (and promises to further introduce) speaking machines into everyday life for many people, and makes it clear that such interfaces will be increasingly indistinguishable from human voice. These emergent systems replicate the nuances, inflections, and vernacular qualities of speech to a degree that has made many commentators uncomfortable (invoking a linguistic/social version of Masahiro Mori’s “Uncanny Valley”). Previous barriers to acceptance of machine-produced language, such as lack of nuance, context, and the subtleties of timing associated with human language are beginning to be surpassed, such that the distinction between them dissolves. This raises ethical questions about language, and its ongoing role in human (and machine) interaction. These technologies also threaten to replace large areas of voice-related employment, such as service industry call centre roles, and so involve the implications of automation more generally. In the fields of computer science and technology there is already well-developed research producing systems that are able to generate ever more “natural” linguistic fluency. Our aim is to add another dimension to this research, by asserting the importance of a dialogue between humanities/science/creative disciplines in addressing the implications of speaking machines. If (as many claim), language is of singular importance to the constitution of the human; the migration of language to machines provides an opportunity for us to interrogate the value of language at an ontological level. Current research in the digital humanities and the philosophy of technology considers a range of questions, including the nature of human/machine intelligence, algorithmic agency, the narratives used to contextualize AI in the broader social context, and the ethics of using machines to mediate various aspects of our personal lives. Yet, the complex relationship between language and intelligence that has preoccupied philosophers since Aristotle has rarely been taken as a central research theme in critical discussions of AI. This journal aims to fill this gap by creating an interdisciplinary platform for reflection on the implications of AI as a linguistic technology. The goal of this issue is to bring together a range of perspectives—including those from philosophy, linguistics, computer sciences, digital humanities and the creative arts—in order to examine in detail the particular role of language in creating the interface between humans and AI/machine learning technologies. It will address languages’ role in getting us to accept these technologies, investigating how the creation of believable/convincing linguistic parallels to human forms of language (via mimicry), invites us to engage with machines as social beings, and builds trust in machine utterances (written and spoken). By approaching computational technologies through a linguistic lens we hope to establish that language needs to become a central (not incidental) aspect of the discourses around the ethics of AI and machine learning. What is the ontological status of language when it is no longer made by humans, but by machines? How do the frameworks that ground our understanding of ethics need to be rethought to account for the social effects of linguistic machines? What epistemological models do we need to understand the relationship between ‘natural’ language and computer language/code? Do machinic languages require us to re-think the relationship between language and cognition? Do computational systems have the agency for linguistic creativity, and what poetic forms might emerge from them and/or our interaction with them? What new pragmatics of language arise from our interactions with non-human linguistic agents? What methodologies—creative, philosophical, scientific—can we develop to address these questions, and to communicate between disciplines? , your address, your email, your affiliation (university or other institution you work for/with). We will review abstracts within three weeks and invited full essays (5,000 words maximum, unless otherwise agreed with the editors) will be due by July 30, 2019. Final acceptance will be subject to peer review. Papers will be published online as ready after September 30, 2019, and the final (full) edition will be available for print, by December 1, 2019.